Take me back to the beach, please! 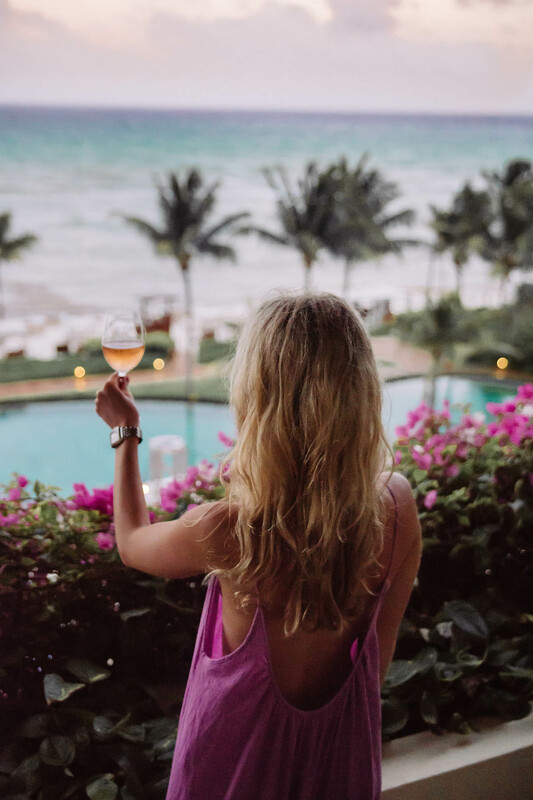 Our getaway to the Grand Velas Riviera Maya last week was one for the books. After a long and miserable New York winter and a very busy start to the year at the office for Nick, a relaxing few days by the ocean was very much needed– and it didn’t disappoint! We spent four days pretty much just laying out in the sun, swimming, walking on the beach and eating (lots) of yummy food with cocktails in hand. I purposely didn’t plan any excursions or activities because we truly just wanted to chill. 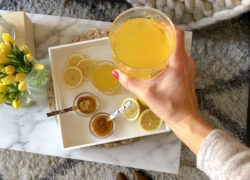 And chill we did! Details on this pom pom coverup and the rest of my beach look can be found here. 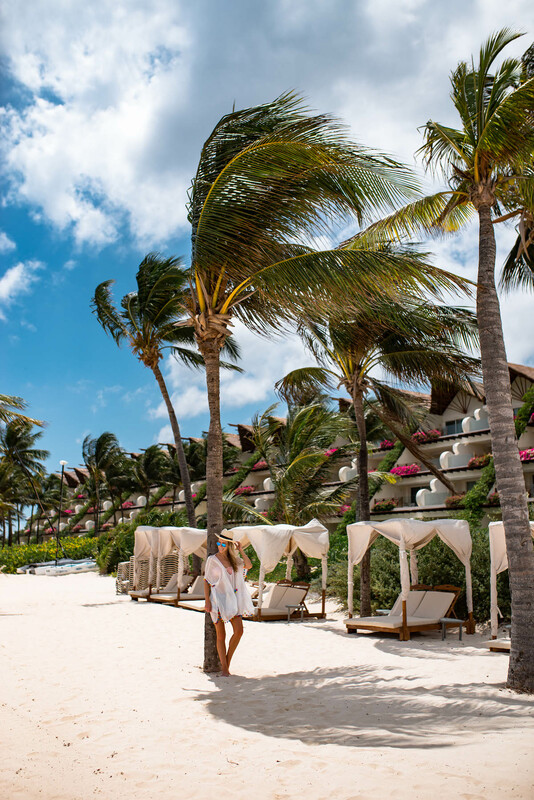 If you haven’t heard of the Grand Velas Riviera Maya here’s the scoop. It’s a luxury all inclusive resort located in Playa del Carmen, about an hour drive south of Cancun. 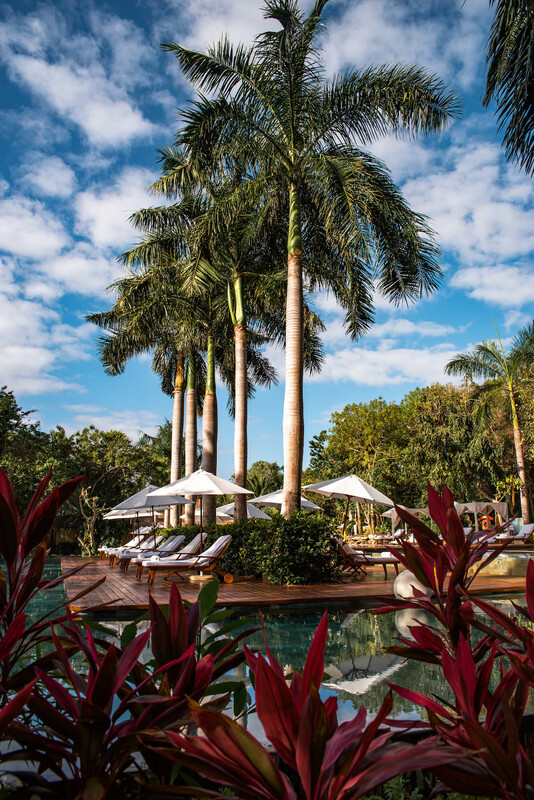 Just envision luxe Yucatan jungle treehouse meets island bliss– that’s the best way I could describe the Grand Velas. I knew the resort was going to be amazing from the reviews, but once I arrived it completely took my breath away. 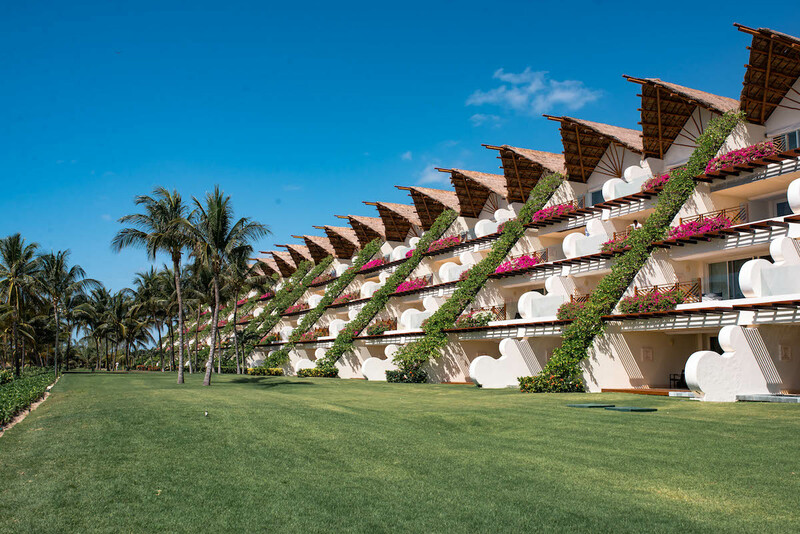 The Grand Velas is huge and completely secluded. 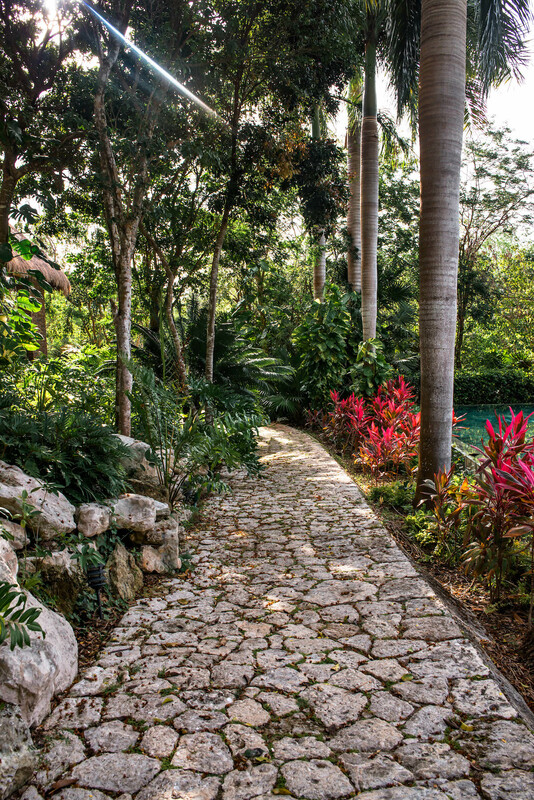 Once entering the gates, you feel like you’re in your own private paradise. So how did we choose this resort? 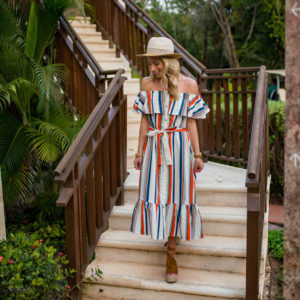 After two amazing experiences in Mexico last year (Nick and I visited Cancun and then I went on a blogger press trip to nearby Mayakoba in Playa del Carmen) I knew I wanted to visit the area again. 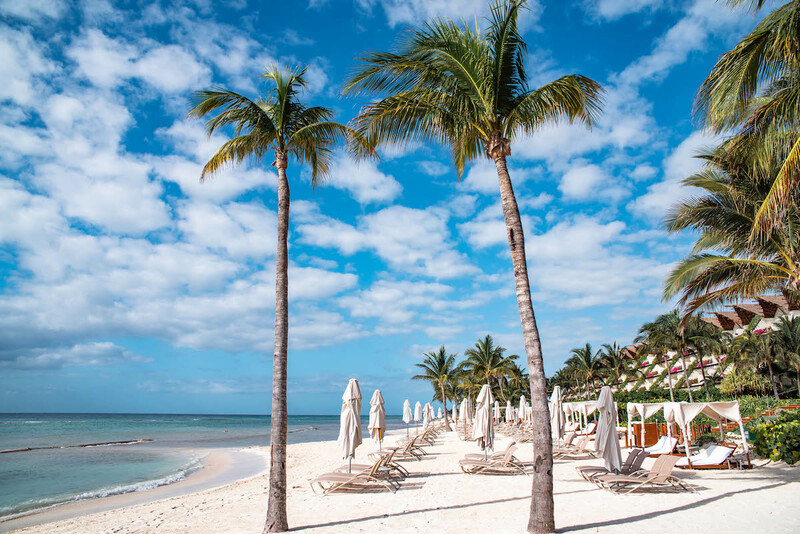 It’s so easy to fly to Cancun from New York (it’s a 3.5 hour direct flight), the beaches are beautiful and the weather is gorgeous year-round. You can’t go wrong! 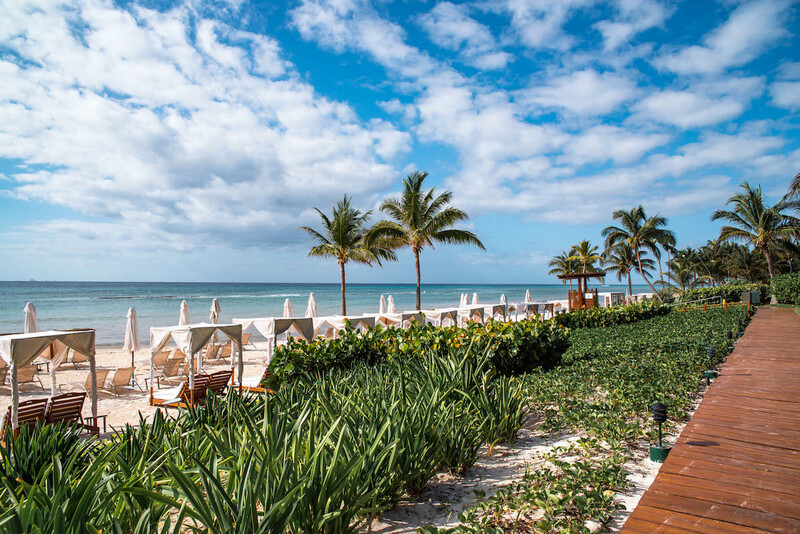 The Grand Velas has the best of both worlds: a beautiful white sand beachfront that you’d expect from any Riviera Maya all inclusive resort and also a jungle, where many of the resort’s restaurants, activities and guest suites can be found. You can literally go from beach to feeling like you’ve stepped into an oasis in the middle of the Yucatan in a matter of a minutes. See what I mean by best of both worlds? 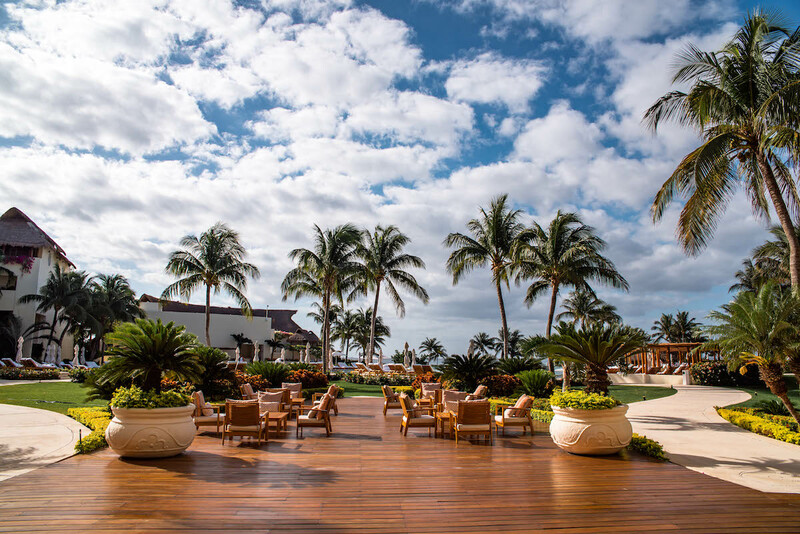 Here’s a glimpse of the Zen area of the Grand Velas. I loved staying in this section because it felt like a completely different resort and was so quiet. After a long hot day at the beach, it was beyond relaxing getting to come back to our suite in the jungle. The shade from the trees and winding elevated paths through the tropical foliage made it feel like we were staying in a treehouse. 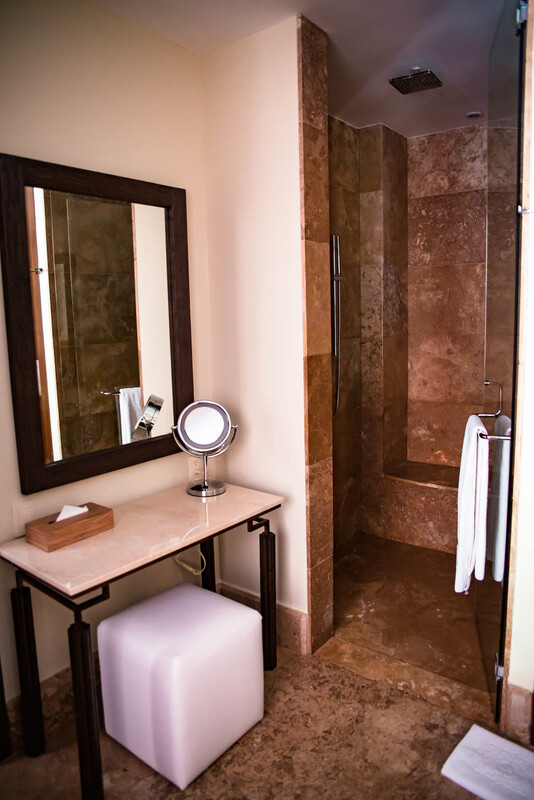 This is also where the famed Grand Velas Spa can be found. One afternoon I had the most amazing oxygen facial! Here’s a look I wore to dinner one night! 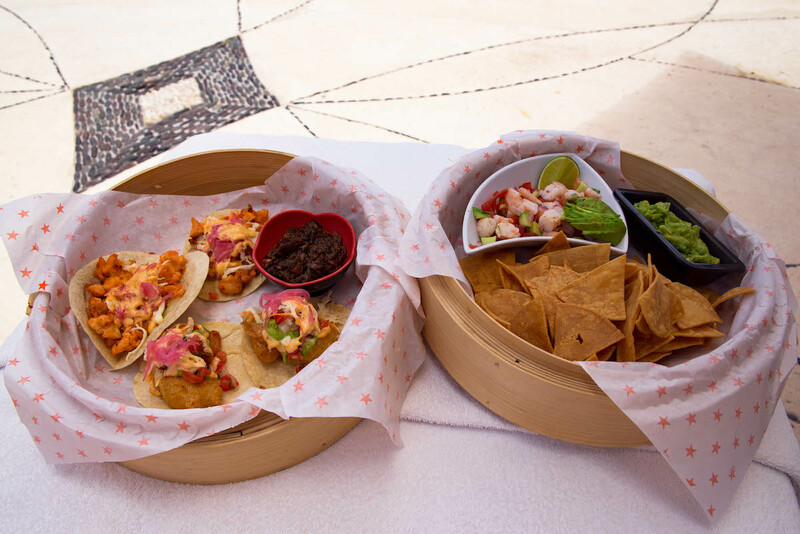 The resort has eight different restaurants (yes, you read that right) so you can easily try a different type of cuisine every evening and never get bored. Our favorite restaurant was Frida– when in Mexico, eat Mexican food and we loved the Frida Kahlo-inspired menu and decor. Can I just say it was so refreshing not having to worry about paying separate bills for meals. 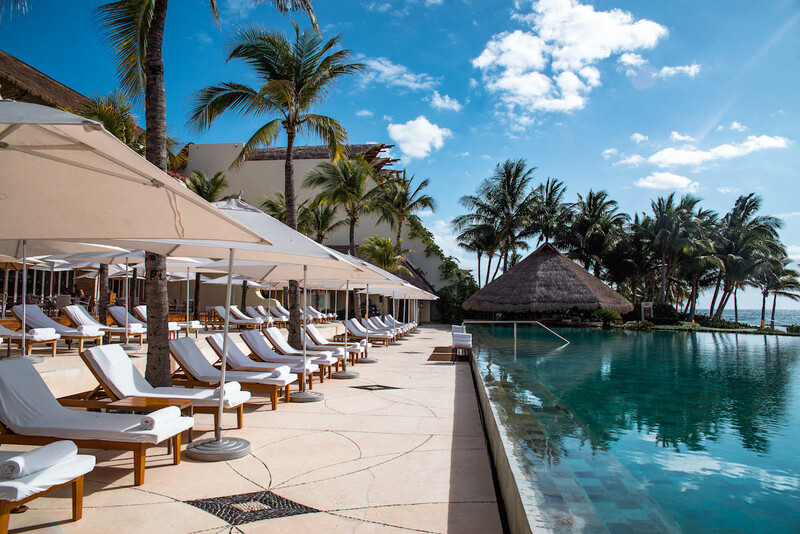 Since the Grand Velas is all-inclusive, food and drinks are factored in your room rate. So yes, that means unlimited breakfast, lunch, dinner and cocktails. 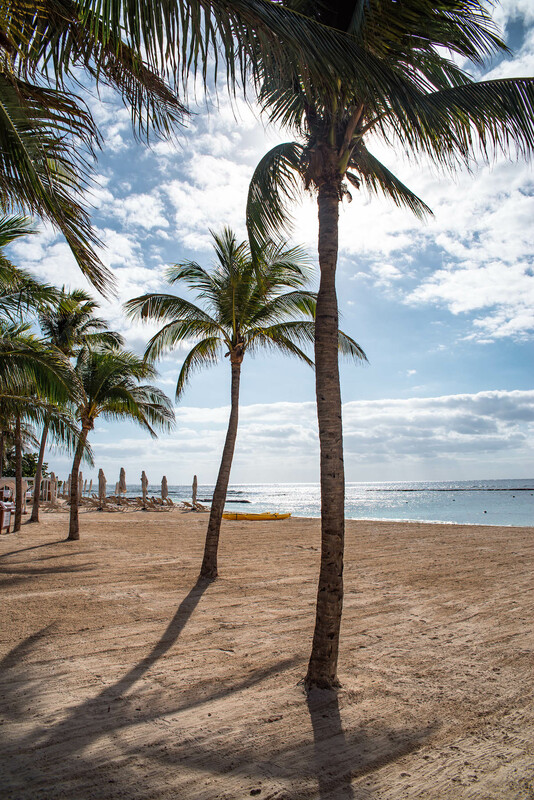 The point of a vacation is to relax and if you truly want to do that, all-inclusive is one of the routes to go. We probably ate three lunches a day because the bottomless menu was just too tempting! All the fresh seafood, guacamole and cocktails were delicious. I’m getting hungry just writing about it! Details on this one piece swimsuit and the rest of my swim look can be found here. As you can see we clearly enjoyed the frozen drinks… The pool and beachside bar service at the Grand Velas was on point. All the servers and staff were so attentive and went above and beyond to make sure guests had what they needed. 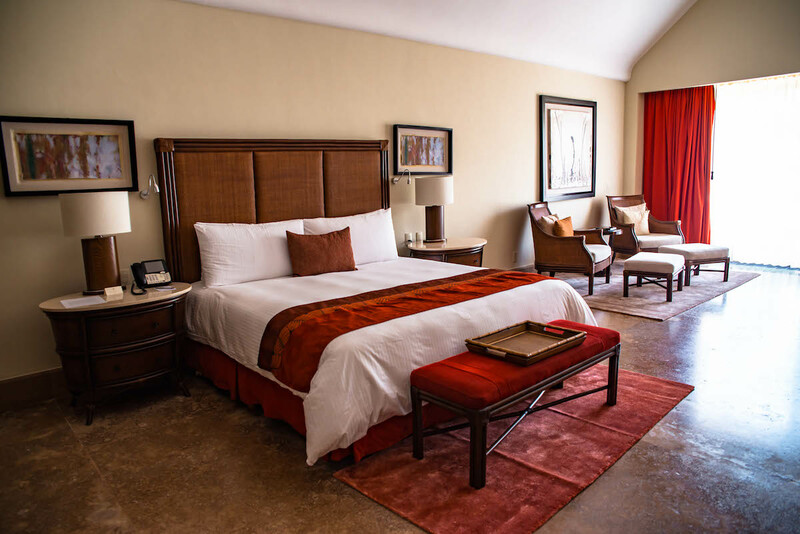 Sometimes large resorts can feel a little overwhelming, so it really impressed me to get such individualized attention. I am so glad I didn’t plan any activities because we were perfectly content just spending our days by the pool and beach. Every morning after having breakfast in our suite (we took full advantage of the all-inclusive room service :P) we took a 2-minute shuttle ride over to the adults-only section of the resort and posted up by the infinity pool and swim-up bar. We weren’t purposely trying to avoid kids or families (I don’t even think the resort was at 50% capacity,) we just loved how this pool had more of a chill boutique hotel vibe. The beach was also just steps away! As you can see the Grand Velas is just immaculate. I don’t think I’ve ever stayed at a resort that is so well-maintained and polished. It was very noticeable just how focused they are on the details and everywhere we went there were staff taking care of the grounds and facilities. 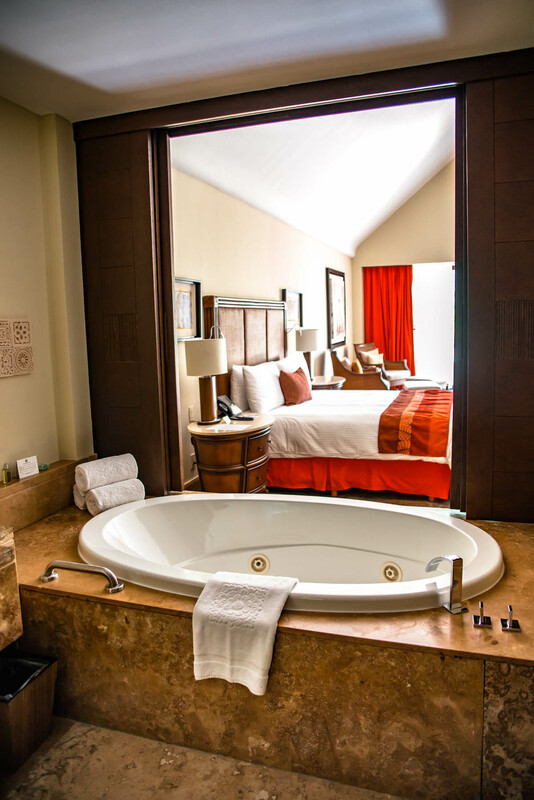 From the suites and bathrooms, to the restaurants, pool and beach, everything was just perfect and squeaky clean. 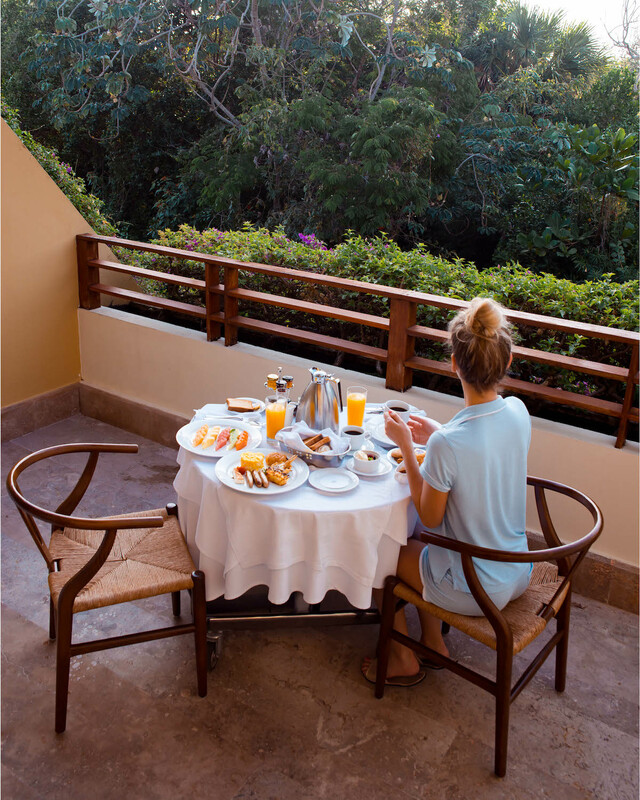 Like I said, we took full advantage of the bottomless room service and had breakfast every morning on the balcony of our suite overlooking the jungle. It was so peaceful waking up to birds chirping instead of honking cabs 😛 We loved our room too. It was spacious, indulgently comfortable and probably double the size of our New York apartment. Can you say #bathroomgoals? Nick and I always geek out a little bit when we get to stay in a hotel room with a double vanity and separate shower and tub. The life! I wish I could’ve transported this bathroom back to New York with me. The waterfall shower was heavenly! 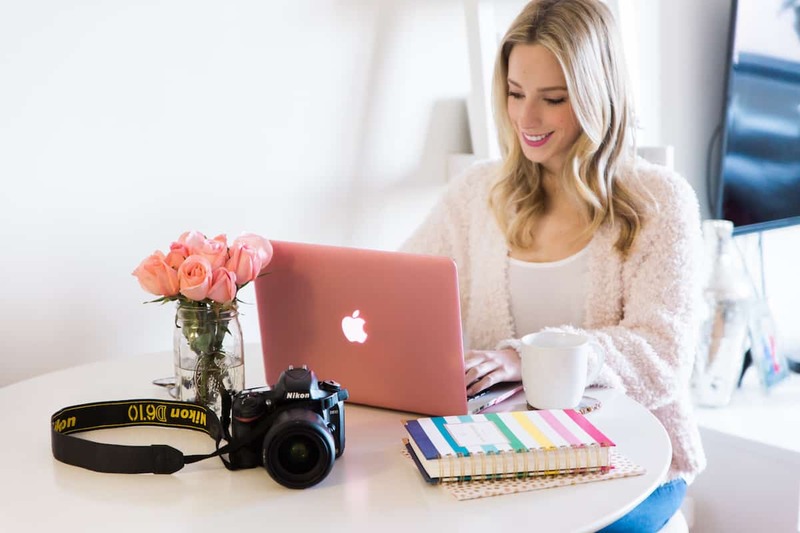 More Posts You May Like! I loved your orange swimsuit! Right? I had heart eyes the entire time! This resort looks absolutely fabulous! It certainly is a must try for my next vacation. The photos are breathtaking! 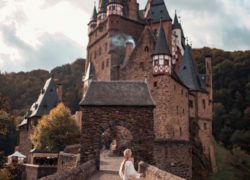 This trip looks amazing! I will definitely do some research on this hotel. 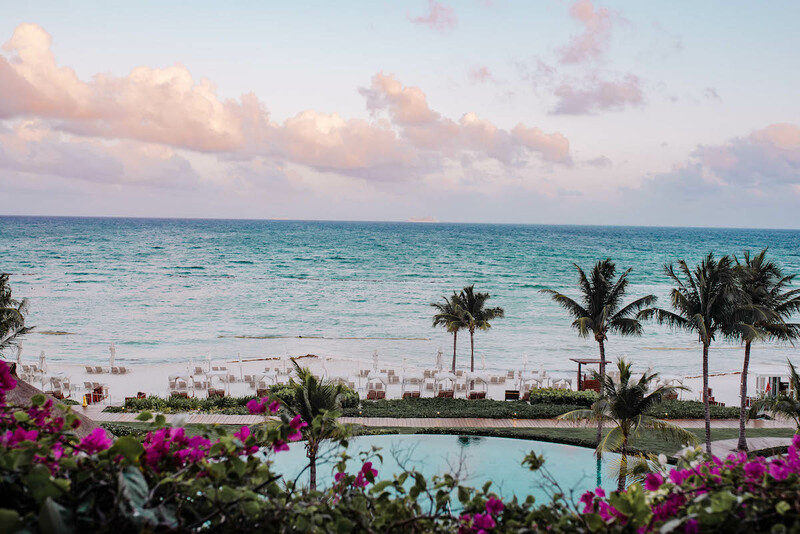 I went to an all inclusive resort back in February but my experience was so so (I wrote about it on my blog). This looks like a much better option! Is this hotel really $1000 a night?!? I wish I could afford a trip like this! Hi, we plan to go with kids and elderly. How’s the beach? Is the water clear and calm ?